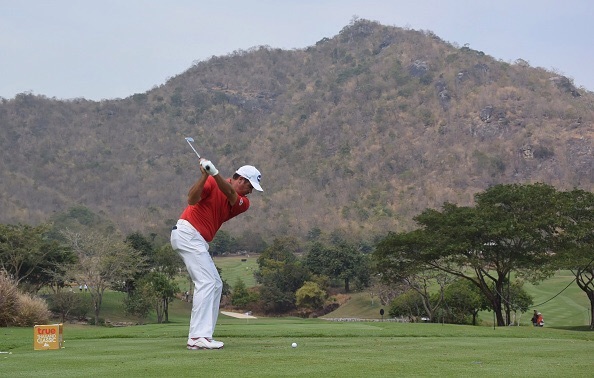 Michael Hoey's hopes of landing a sixth European Tour win this week faded when he posted a one over 73 in the third round of the True Thailand Classic presented by Black Mountain. Three shots behind Mjguel Angel Jinenez starting the day having followed his course record 64 with a 72 on Friday, Hoey was trampled in the stampede on Saturday. Despite an early birdie at the fifth, the 36-year old bogeyed the 10th, 12th and 15th before clawing back a shot at the par-five 18th to end the day tied for 27th on seven under. As a result, he fell eight shots behind big-hitting Australian Scott Hend, who will take a one shot shot lead into the final round of the inaugural staging of the event. The 42-year old carded a brilliant, six under par 66 on day three to lead n 15-under par from Thingchai Jaidee (67) and Ryder Cup captaincy prospect Miguel Amgel Jimenez (69). Hend, who won the Hong Kong Open in October, came within a whisker of an albatross at the par five 13th, tapping in for eagle. Another home hope, Kiradech Aphibarnrat is two shots further back at 12 under after signing for a 70, while four players are 11 under – Australians Andrew Dodt, Richard Green and Wade Ormsby and Sweden’s Alex Noren. Hend said: “It was a good round and puts me in a good position. I played very solidly and putted quite well. "I only made one mistake so it was pretty good. It was a nice long drive on 13 – it hit a wet patch from the rain and picked up a bit of speed down the hill. "I hit a nice little five iron in there and got a good bounce on the fringe of the green. "I’m not sure how close it was to going in but it was nice to walk up there and see it very close. I did wonder if it had gone in when I heard the cheers – I couldn’t see the hole from where I was. “This is where you want to be, in the last group on a Sunday. I’ll be playing with Thongchai again and Miguel so it’ll be a good little test tomorrow. Damien McGrane had three birdies and five bogeys in a 74 and shares 72md spot on one under. ** P Uihlein (USA) 69 70 WD.